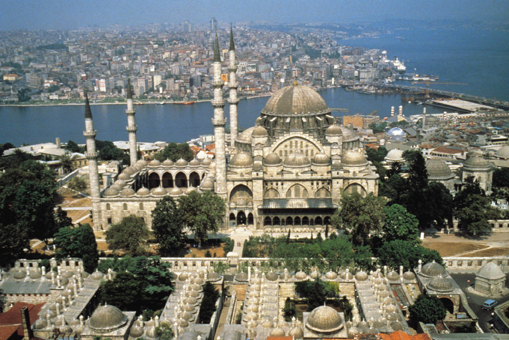 I arrived in Istanbul, Turkey, at midnight and my Muslim contact Davout picked me up. After a long ride, I arrived at a Muslim apartment on the Asian side of the city. When I finally got to bed on the couch it was pushing 3:00 am on Friday. I spent the next day with Muslims who were trying to convert me to Islam. They gave me the grand tour of sights on the Asian side of Istanbul, topping it off with a fine lunch. Later, they took me on a ferry ride across the Bosphorus to the European side where I would be staying for the coming week. I was staying on the fourth floor of a building on church property, in a room overlooking the beautiful strait flowing from the Black Sea into the Marmara Sea. On Sabbath, I spoke to the small gathering of Seventh-day Adventists and Muslims who have been attending this little fellowship over the years. Most of the Adventists, including the pastor, were Muslims at one time. Whenever I speak to Muslims, I always pull out my 1843 and 1850 charts, which show the Muslim Ottoman Empire and how they were a major player in prophecy during the Millerite era. I just lay out the simple message of the meaning of those charts, and it always touches a Muslim’s heart to hear that the Bible says good things about their side of the family. One of the Muslim ladies who listened to this message came to the pastor after the service and requested further studies in order to become part of the Seventh-day Adventist church. She has now been baptized into the church. Davout, who had picked me up at the airport, has friends in the government ruling party and wanted them to hear our message about the Muslims in prophecy. A meeting with these people had been scheduled for Monday and Davout invited my translator and I to come. My translator, Asif, arrived Sunday afternoon and we began praying and planning for the next day’s opportunity. When Monday arrived, we went to the convention center and Davout introduced us to many people. I realized that the schedule was already set, and we were not included. It lasted over two hours and had eleven speakers. They seated Asif and me on the front row. As I listened to the translation, I heard some interesting similarities to communism. It sounded like hero worship, much like how Lenin was admired in the Union of Soviet Socialist Republic. All the speakers talked about Said Nursi, a promoter of back-to-Islamic rule in the government, who died in 1960. Said Nursi had 12 disciples he had taught. Two of these are still living and I met both of them at this meeting. Afterward, we were invited to a special lunch, and then to another meeting. I met many people, but had no opportunity to share what Seventh-day Adventists know about Islam in the Bible. 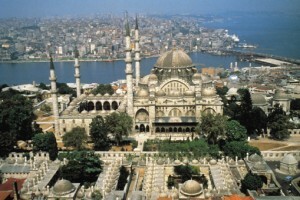 The following day we were invited to yet another meeting at the Blue Mosque. Inside, were a small group of tourists from Europe and we sat for a lecture on becoming Muslim. This was not at all why I had come to Turkey! In the late afternoon we were invited to another gathering, but this time I declined. I had had enough Muslim evangelism for the day. Even my young Turkish translator was not happy with all the running around to meetings with no opportunity to share our special message! I was disappointed, but would not let myself be disheartened as I tried to encourage my friend. I told him the week was yet young and God can still work in many ways. On Wednesday, we received a call from Davout again. He invited us to yet another meeting. Everywhere we went, we had been dragging along my computer, Bible, Qur’an, Maroon Resource Book, and a rolled up set of 1843/1850 charts. This time, I left it all behind except the charts, since pulling a heavy wheeled case over cobblestones was growing difficult. We arrived a little late and were ushered downstairs to an eating hall with a table set just for us. At the table, besides Davout, was our Muslim host whose name is Sumit. He was the one who had been arranging all these meetings. Among others, one of the Said Nursi’s disciples was in attendance. After lunch, we just sat and talked about various things, and then Sumit asked me to share with them what was on my mind. By this time I was wondering if it would be worth it as we had not much to show for our efforts. I kept thinking about all the letters and emails I had sent out for prayer to be with us in this venture. Sumit mentioned to me that the older, white haired man had to leave at 3:00 pm, so I realized I would have to be quick and to the point. I began by telling the story of Ishmael and Hagar and the double blessings Abraham’s offspring received in Deuteronomy 21. I told how their side of the family received the whole Middle East when Isaac’s side only received the land of Canaan. I talked about how Moses was trained for 40 years by a priest from their side of the family, and then gave Jonah’s story. All the while, both of these leaders were shaking their heads in agreement and smiling at one another. When I presented the charts, they paid close attention. I told them that Islam was called by the God of the Bible, and it was their countrymen who responded and answered the call of Revelation 9:12-15 to come and deliver the young Reformation Movement. It was now near 3:00 pm, so I sat down. The older man left and Sumit made a phone call. As Asif and I went to leave, Sumit came back to us and said, “Tomorrow I have a newspaper interview arranged for you, and a TV program on Friday.” Once outside, Asif and I praised the Lord for what He had just done! The next day we went to the office of the newspaper. The editor began the interview, but was not recording anything electronically or on paper, and I wondered how he would be able to remember everything I said. He then asked if I could write a weekly column on what we, as Seventh-day Adventists, believe and teach about the end times, and how Islam fits into end time events. I agreed heartily! As the conversation continued, my mind was racing to the statement that God will take the reins into His own hands to finish the work. This was an amazing moment. I was struggling to keep my emotions under control as I explained more of the message. Asif and the editor started spreaking to each other in Arabic. The editor was understanding and accepting the concepts of Jesus and sacrifice. Then they asked each other how it was that they both knew Arabic. It turns out that they are both from the Turkish town of Antioch, both from the same tribe, and both had the same aunt! That means we now had someone who was both a friend and a relative in the paper. Incredible! On Friday, we traveled seven hours to the television station. We told the station manager about what Seventh-day Adventists believe and included the charts. He called three of his friends from the Turkish Office of Education and they came over immediately. They listened while I repeated the story. Next, we were interviewed on television, sharing our beliefs. Remember Said Nursi? In every single meeting I had in Turkey, the people told me that Said Nursi had predicted that at the end of time there would be a small group of Christians who would come to them. They would tell them things from the Bible regarding the end time and the second coming of Jesus. So now, when Asif and I showed them the Ottoman Empire in Bible history, they were convinced that Seventh-day Adventists do have the last message for the Muslim world! My friends, reaching Islam is not hard. God has a way, and it is not based on other Christian’s methods, it is based on the same Three Angels of Revelation 14, just in a different order of delivery. By Stephen Dickie. Website: www.strawberrymeadowassociation.com and www.islambibleprophecy.com. Email: sdickie@hotmail.com.